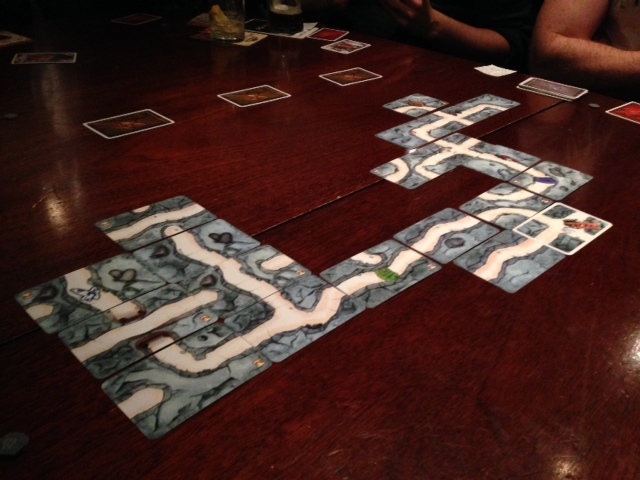 This is a game that features regularly at the boardgamesireland.com meet ups. 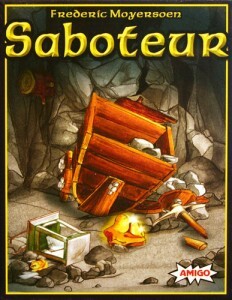 Saboteur and it’s expansion, Saboteur 2, are really portable and the rules are simple enough to be taught to people quickly. It can support up to 10 players (12 with the expansion) and as such is a perfect warm up game to start an evening of gaming. For such simple game it contains a lot of fun elements such as exploration and bluffing. The Start Card which is the entrance to the mine is placed on the table and the three Goal Cards are placed on the other end of the table, each seven card widths apart from the start card. Only one of the goal cards contains gold, the other two contain coal. The goal cards are shuffled and placed face down so that no one knows which card contains the gold. Each player will have a hand of cards that can contain path cards and action cards. On your turn you can choose to play a path card, and action card or pass by discarding a card and taking a new one. Path cards are placed on the table next to an existing path card or the start card and the idea is to create a continuous path to a goal card so that the goal card can then be turned over to hopefully reveal the gold. A complicated mine begins to take shape. Instead of placing a path card you may also choose to play an action card. Most action cards allow you to break the equipment of another player (Lamp, pickaxe, wheelbarrow) making it impossible for them to place any path cards until a repair action card matching the broken equipment is played on them. 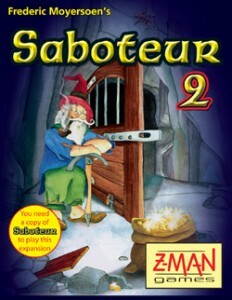 This makes for a useful way to put a stop to players that you might suspect of being a saboteur so they can’t continue to lead the tunnels in the wrong direction. Another action card that can be played is the Map card. This will allow the player to look at one of the 3 goal cards to check to see if it is gold or coal. They check this secretly and it is up to them if they want to share the information or not. And of course they can also lie, which is useful if you’re a saboteur and want to lead the other players in the wrong direction. The final type of action card is the demolish card. This will allow you to remove one of the already placed path cards from the table. This is useful if you want to remove a dead end card that may have been played by a saboteur. 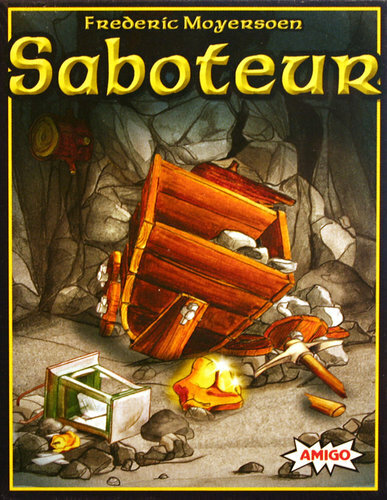 Or if you are the saboteur you may choose to demolish a path card from near the beginning of the mine forcing the other players to replace it a card that fits just as well before they can continue to dig towards the gold. The amount of gold received by the winning side scales depending on the amount of players. The game is played over 3 rounds with new Dwarf cards given out each round so that everyone’s roles change each time. The person with the most gold at the end of the 3 rounds is the winner. This makes things a lot more fun as you try an work out exactly what role the other players are using. The team system works by having certain path cards with different coloured doors on them. If a path makes it to the gold but has a door that isn’t your teams colour along the route then your team doesn’t receive any gold.